Children love to live in the moment and feel in control of their surroundings. They do not feel the need to strive for perfection, and they love to express their creativity without the self-conscious thoughts that adults often fear. It is easy to get frustrated when children want to make a mess with paint, they do not stay in the lines coloring or they make a purple sun and blue tiger instead of adhering to the neat and organized mindset that we have as adults. However, there are many benefits to encouraging your child to engage in art, and there are countless different ways to foster the love of art and creativity. The benefits of art in child development are often overlooked. Engaging in artistic activities develops creativity, but it also helps children develop in many other ways. They develop and refine their fine motor skills as they learn to manipulate paintbrushes, crayons, markers or molding clay. They learn about science as they experiment with different materials and colors. There are forms of art, such as sculpting objects out of clay, that require children to problem-solve, which aids in developing their critical thinking skills. One of the most beneficial effects of art is the self-confidence that children gain from creating their own masterpieces while feeling free to make mistakes and make new creations on their own. This is an invaluable concept for children to learn and the impact of it stretches far beyond the arts and crafts table. There are many different ways to encourage art and creativity in children. The first thing that we have to accept as adults is that it is ok for them to make a mess. 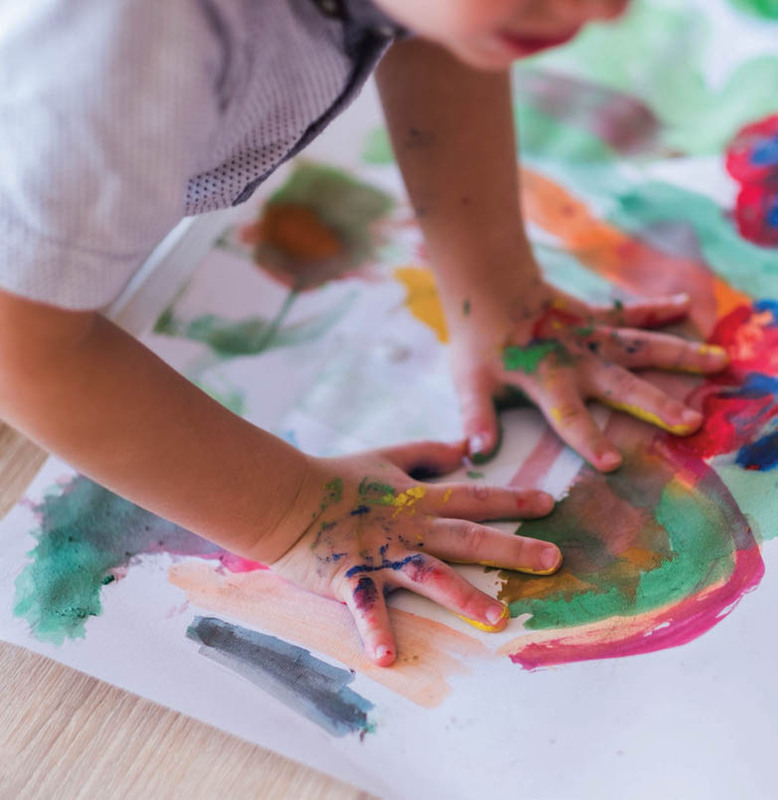 The benefits of allowing your child to engage in art and creativity far outweigh the need to keep everything clean and orderly so, even though it is difficult, allow them to make a mess! It is also important to avoid giving them direction or suggestions. Allow them to use their own imagination and creativity to create whatever they want without feeling like they will disappoint you if they do not make their artwork exactly how they think you want it to be. You can ask questions or make comments about their own creative thoughts. “It looks like you made the elephant orange, why did you choose that color?” You are acknowledging that you notice what the child did and engaging in conversation about it without criticizing. Another conversation starter could be, “Tell me about what you made and did you have fun making it?” This allows the child to lead the conversation and explain their creation in their own words. Finally, allow what they did to be enough. Often children will scribble a few different colored lines and dots on a sheet of paper and say they are done drawing. Simply comment on how colorful their picture is and allow that to be enough, which will allow the child to feel that what they created is enough. Art can be fun for both children and the adults in their lives. Instead of always sticking to crayons, markers and watercolor paints, experiment with different objects and materials. Allow the child to pick out different objects from nature such as pinecones, leaves, rocks or acorns to paint, glue onto paper or use however they want to. You can also show them how to use things like apple halves, bottle caps, sponges and corks to dip in paint and make interesting pictures with the prints from the objects on paper. Children are spontaneous and love to live in the moment so allow them to think of new ways to be creative. Most parents would admit that one of their primary goals in raising children is to encourage independence, creativity and self-confidence. Encouraging art and creativity in children is a great way to help your child develop all of those skills, as well as further develop other crucial proficiencies, such as fine motor and critical thinking skills. Art activities can be inexpensive but will make your child happy and make a huge impact on their development, so pull up your sleeves, throw a floor covering down, gather your supplies and encourage their unique creativity!